“He says education is the thing if you want to compete Because without it son, life ain’t very sweet.” Lyrics from the 60’s song “Color This Man Father” by The Winston’s. All I can say from this inspirational 60’s song by the Winston’s is “Amen.” You want to be a better angler where trout will tremble at your approach, while other anglers hold you in awe? Seize the moment, attend a Fishing School at Healing Waters Lodge. Our goal is to make you a better angler by immersing you in six nights and five days of fishing, instruction and piscatorial know how. Our fly fishing schools include six-nights lodging, all meals at the lodge along with complimentary beer and wine, and five days of guided fishing, floating and instruction. Plus, there is more; all the fishing equipment you need to be both looking good and feeling good on the river. The classroom is limited to about 40 minutes after breakfast, then off to rivers and streams where the real schooling begins. Students will have fishing opportunities on the Big Hole, Beaverhead, Madison, Jefferson and Ruby Rivers. Healing Waters has quite a bit of private water in the form of spring creeks, lakes and ponds along with private access on major rivers available to our guests. We stay agile and mobile putting you onto different fishing environments using fishing techniques dictated by the rivers and their inhabitants (Trout). LEARN TO TRULY CAST. A fly rod can be insensate, soulless and an inanimate tool. 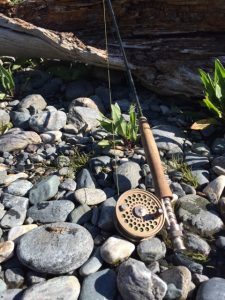 Or, a fly rod becomes a talisman enabling you to cast 60 feet of fly line, while landing a dry fly like a soft dew drop six inches from a rising trout. Oh heart be still! Yes, Healing Waters Lodge is the place where casting dreams can come true. Our instructors have patience, knowledge and are “Casting Whisperers” to anyone that heeds the call. Good casters feel the soul of the fly rod and we impart this to our students. Learning to truly cast is going beyond the mechanics of just casting but really developing a feel or relationship with a fly rod. Reach Cast: Mending the fly line in the air is the most essential cast you will use fishing in the West. Learn to reach cast and your angling is immediately elevated. Double Haul: Double hauling takes a little commitment, a little time and the proper instruction. Double haul casts result in greater line speed to drive fly line through the wind, more accuracy and increasing your casting distance. The keys to the casting kingdom await you. Rolls Casts: A sneaky way to present a fly in tight quarters when surrounded by brush, high banks and other nefarious impediments. Steeple Cast: Another cast that will bamboozle trout and spectators. Trapped up a against a 1000 foot cliff wall when you spot a large rainbow sipping Pale Morning Duns deploy a Steeple Cast. Curve Cast: Think Sandy Koufax who without a curve was just a fastball pitcher. Koufax with a curve from 1962 to 1966 he went 111-34 with a 1.95 ERA, won the NL ERA crown all five years and had seasons of 25-5, 26-8 and 27-9? He won an MVP Award and finished second in the voting two other years, while winning three Cy Young Awards. Learn the Curve Cast and prepare to receive a bounty of fishing riches. The elements of a good fly cast: Loop control, loop shapes, grip, power application, back cast stop, fore cast stop; timing of pause, foot stance, pickup, follow through. Give us five days and we will give you a life time of better fishing skills. MANAGING FLY LINE. My gentle fly fishing snowflakes who are unique and special in your own way, learn to manage fly line and the kingdom of trout fishing is upon you. It seems simple but properly managing fly line may be the most important element in being a successful angler. This means learning how and when to throw ten feet of line and when to unload all the line you can. Line management is also controlling the line once the fly has touched the water. When do you mend, when do you strip it in or when might you skate it across the surface appealing to baser instincts of predatory brown trout? Managing fly line is critical to good angling. READING WATER. Interpreting the movement of water as it applies to anglers and trout. Caddis flies, nature’s jazz fans, enjoy the bebopping rhythms of riffles. Trico’s delicate mayflies suggest Shubert’s Trout Quintet with softer quiet water. Stoneflies, the largest of the aquatic insects in Montana, seem inclined to heavy metal music that infuse the rivers with spring runoff. We are instructing where trout are by interpreting the color and hue of streams, the breaks in waters movement, distinguishing depth of rivers by the vacillation of light. And we know. 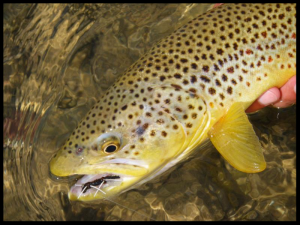 We know when trout move off the heavy banks wandering into the quiet side of the river. We know when fish hang tight to the banks and drift into the deep pools. Our instructors are real guides, interpreters of streams and trackers of trout. They have the right mixture of science and mysticism which makes them excellent. The art of reading waters is making the invisible visible. CONSERVATION. For Healing Waters Lodge is doing the right thing when no is looking. There is a proper way to play and release a trout. There is also the equally important role we play as conservationists protecting the natural world not for us but for future generations of anglers. Healing Waters Lodge fly fishing school package includes single room occupancy, all meals at the lodge, and use of loaner equipment. Our guest rooms have two queen-sized beds, private bathrooms, wi-fi, patios with fantastic views of the surrounding landscapes. We have an exercise room, outdoor hot-tub, and casting pond with trout to cast to. Our cuisine is prepared fresh daily by our Chefs and include a heart breakfast, stream-side lunches, appetizers followed by a fine dinner. Beer and wine are complimentary to your meals. We boast a small on-site fly shop equipped with loaner gear for our guests to use: rods, reels, waders, boots, walking sticks, and even rain coats. The instructors and guides at Healing Waters Lodge are true professionals. This select group takes considerable pride in their abilities to transfer their fishing expertise to others as well as well as sharing their ethos on fishing and conservation. 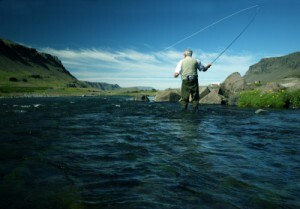 The fly fishing schools at Healing Waters Lodge are designed for the novice as well as the expert. If you are seeking the rich pageantry of an angling life take a short cut to our Fly Fishing Schools. Two schools in 2018: April 22-27 and April 28-May 3. Contact Mike Geary at 406-459-2030 for more information.